The UFC Fight of the Year is only a week away and Conor McGregor is making the most of the promotional press-conferences to makes sure things are at a fever-pitch when he faces Khabib Nurmagomedov in Las Vegas. Bet on McGregor vs Nurmagomedov at Intertops Sportsbook. No matter which boxer is victorious on October 6th, Intertops Sportsbook customers will be winners thanks to the company’s attractive specials. 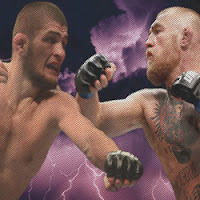 The world’s first online bookmaker has reduced the juice on its ‘To Win’ odds for the fight with Nurmagomedov, currently priced at -155 and McGregor at +140. It has also introduced an attractive stake-back special. Before entering the octagon for the first time in almost two years, the notorious Irishman, Conor McGregor, let the unbeaten Russian champion know that he was going to ‘love putting you out of your misery and stomping on your head’. McGregor claims to be back even stronger after going thirty minutes in the boxing ring with Floyd Mayweather, but the bookmakers at Intertops are not so sure.